My dear neighbor, Maggie, delivered some of these scones to us shortly after sweet girl was born. I haven't forgotten them, they were that good. So I swiped her recipe from her blog and made some for us. They're yum. A serious yum. (She adapted from Joy the Baker's Peach Cobbler Scones, I adapted a bit from there). 1/4 cup milk (for brushing dough). 1) Place flour, sugar, baking powder, baking soda, salt in food processor. Pulse. Add butter, pulse until coarse crumbles form. 2) In large measuring cup, measure milk, add egg and vanilla. Whisk. 3) Add wet ingredients to food processor, until they have just combined. 4) Turn out to flowered surface. Knead 15x. 5) With rolling pin, roll into a large rectangle, dough about 1/2 inch thick. 6) Add cherries to one half of the rectangle. Brush the other side of the rectangle with milk. Sprinkle sugar and cinnamon over the cherries. 7) Fold the dough over the cherries. Cut into 8 portions. 8) Brush with more milk and sprinkle with cinnamon sugar. Bake @ 400 for 15-18 minutes. 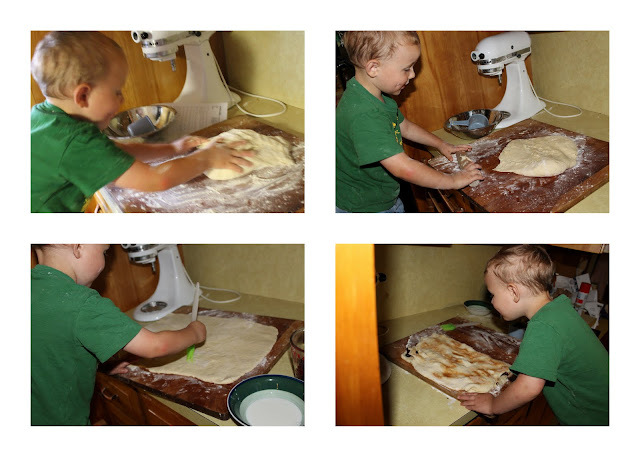 It really was a perfect activity for little hands-running the food processor, kneading, using the rolling pin, sprinkling cherries and cinnamon sugar, painting the dough with milk. OH MY GOSH, they look sooooo good! These look and sound delish!! These look amazing. I know what we are making for breakfast on Sunday.